During your first visit to a chiropractor serving Geneva, you can expect him or her to ask you to describe your pain and other symptoms. For example, you might experience dull, throbbing, sharp, or stabbing back pain. Your chiropractor may also need to know about the onset of your symptoms and how long they’ve persisted. Different health problems can lead to different types of back pain. Acute pain occurs abruptly and resolves within a certain period of time, usually three to six months. For example, a back sprain or strain causes acute pain. Sometimes, acute pain can lead to chronic pain. Many patients work with chiropractors to resolve chronic back pain. Chronic pain persists longer than three to six months. There are two main types of chronic pain. It may be caused by an identifiable cause such as an injury. Or, it may persist despite the absence of an injury. For example, you may have suffered a back injury that healed, yet you’re still experiencing discomfort. Neuropathic pain, or nerve pain, is not necessarily related to an underlying injury. Rather, it is believed that nerve pain stems from the continued transmission of pain signals to the brain despite the lack of tissue damage. Nerve pain also feels differently than musculoskeletal pain. Patients often describe it as being sharp, stabbing, burning, or numb. Axial pain is also sometimes referred to as mechanical pain. Axial pain is quite common and is often the result of a muscle strain in the back. This type of back pain may manifest in a number of ways. It may feel dull or sharp, and it may be ongoing or periodic. 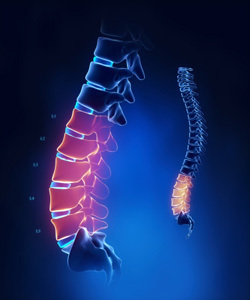 Radicular pain occurs when a spinal nerve root becomes compressed, inflamed, or damaged. It may be caused by spinal stenosis or a herniated disc. Patients often describe radicular pain as feeling “deep.” It radiates from the back through an extremity. Although it may sound counterintuitive, pain doesn’t always occur at the site of an injury or other problem. This is known as referred pain. Referred pain tends to radiate to various parts of the body. The intensity of pain can vary. It often feels like a dull pain or achiness.